A local man has recently been killed on a Brooklyn construction site. The incident was an example of a deadly caught-between accident, one of the most common causes of deadly accidents on construction sites nationwide. Learn more about the recent accident below, and contact a Manhattan construction accident attorney if you’ve been hurt on the job at a New York construction site. The recent accident occurred at around 3:00 pm on Saturday, March 10, 2018. The fatal accident happened in Bushwick on a job site at the intersection of Stewart Street and Broadway. A forklift carrying a large load of pipes to be used for scaffolding was lifting its payload near the flatbed truck that had transported the pipes to the site. As the forklift was raising the pipes, a 46-year-old worker on the site walked between the forklift and the flatbed truck. As he was doing so, the load of pipes on the forklift shifted, causing the forklift to tilt to the side toward the truck. Sadly, the worker was crushed between the forklift and the truck. The man was taken by emergency personnel to Brookdale University Medical Center, where he ultimately succumbed to his injuries. The Occupational Safety and Health Administration (OSHA) has labeled caught-in or caught-between injuries one of its top four construction hazards. Caught-between accidents are defined as accidents where the victim is squeezed, caught, or crushed between two or more objects or parts of an object. These accidents include trench collapses, injuries where a machine pulls a worker or one of their limbs into the gears or components, or where a moving piece of equipment pins a worker against a stationary object or wall. 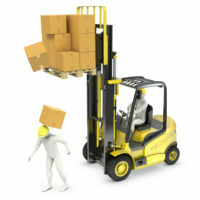 In order to prevent these accidents, OSHA requires that employers place proper guards on machinery, as well as appropriate supports on equipment that could tip or roll, such as supports which might have prevented the forklift in this case from tipping. Workers must also receive appropriate training on how to move around working machinery on a job site. When owners, developers, or independent contractors fail to uphold these important safety standards and workers get hurt, these workers may have a legal claim for damages against the negligent parties responsible for their injuries. If you’ve been hurt on a New York job site and need legal help getting the money you’re owed for your injuries, contact the dedicated and seasoned Manhattan personal injury lawyer Leandros A. Vrionedes for a free consultation at 212-889-9362, with additional offices in Queens at 718-777-5895.